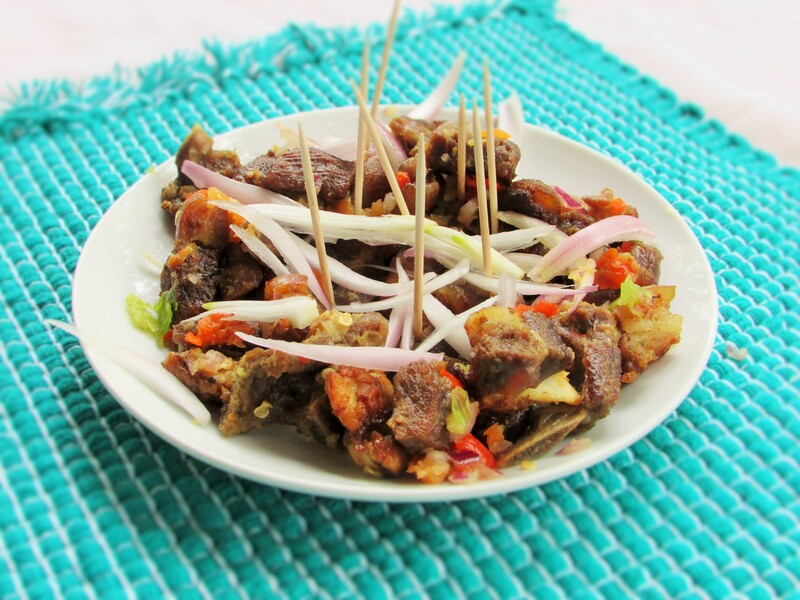 I wanted to make some Asun, but I did not have a smoker nor an outdoor grill so I decided to go a different route and each process I followed helped to infuse flavors into the goat meat which when you try it, it will leave you wanting some more. I did a different process in between, but I kept the basics of the dish. I believe that no matter how much one tweaks a recipe, one has to honor the basics and origin of the recipe. The process I did in between simply helped me build the flavours into this dish. I also did not want a hard tasting or a tough tasting meat, so it worked just well! I am quite happy with this dish. I cannot even go on to explain any more about how happy this dish made me as it always leaves me salivating…oh yum! 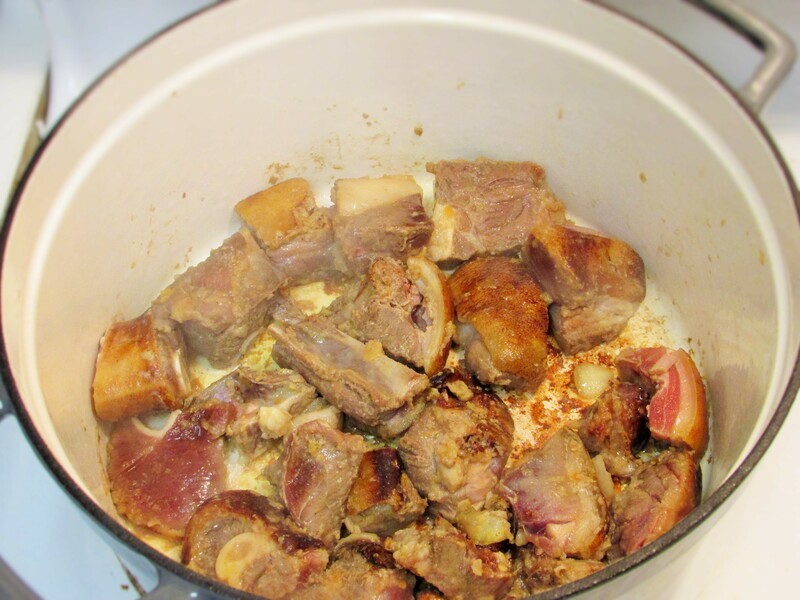 Heat the remaining tbsp of oil in a heavy bottomed pot and sear the goat meat for about 5minutes on each side ie until a little brown(you could skip this part). 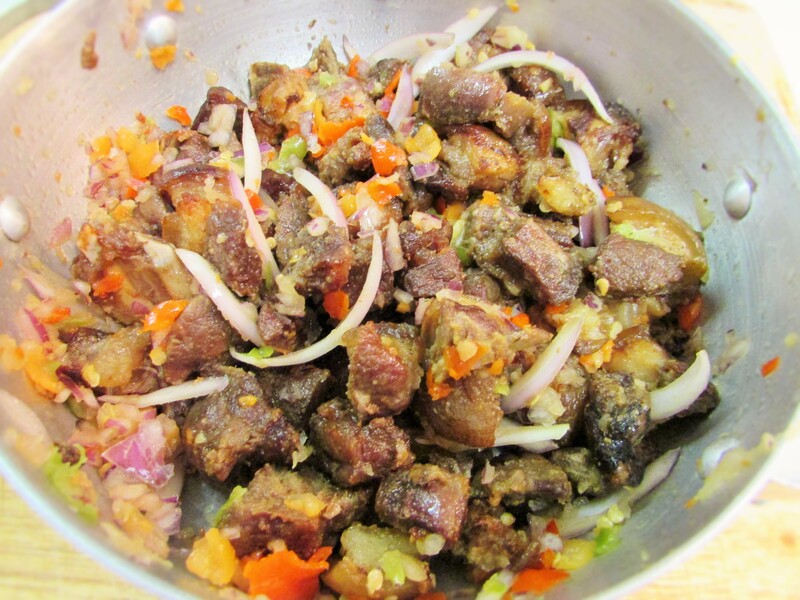 Pour in some water just to the level of the meat and season with salt if any more seasoning is needed. 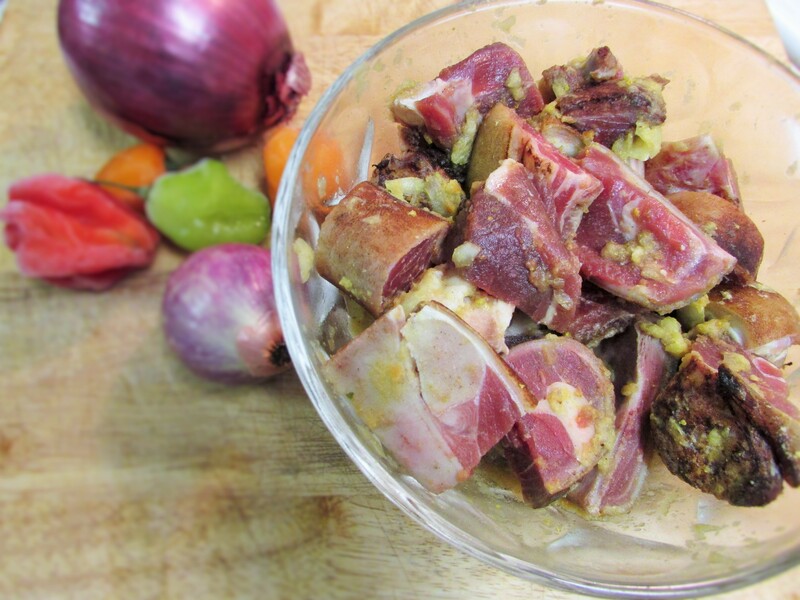 Cook goat meat until tender and until the meat stock is dry, but not burnt(i.e the meat absorbs all the stock and retains flavor). Pre heat oven to 350 degrees. 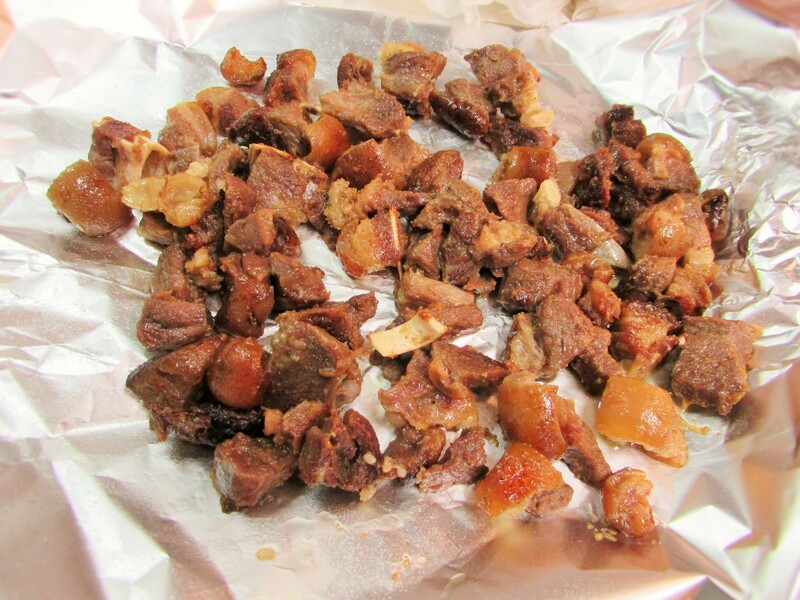 Chop the meat into little pieces, removing most of the bones. 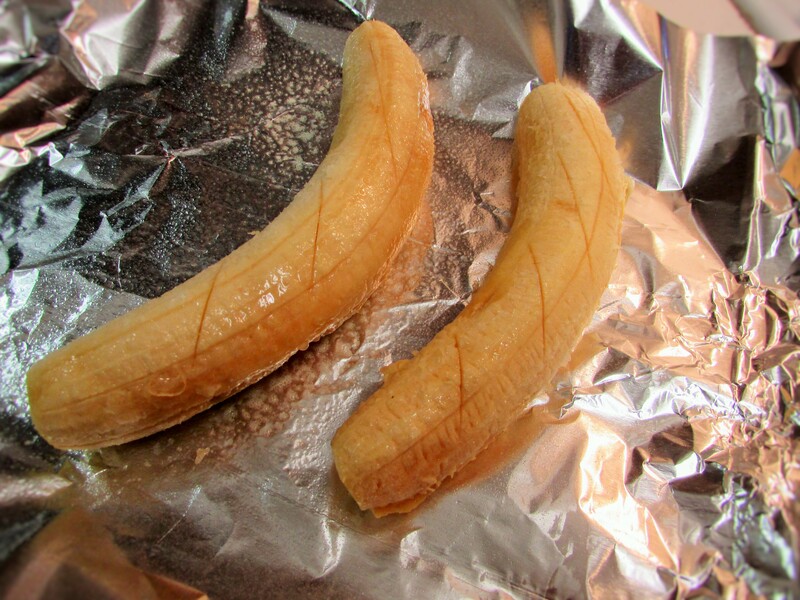 Line an oven pan or tray with foil and place the meat into the pan and roast it in the oven for about 15minutes or until golden brown, but not burnt. 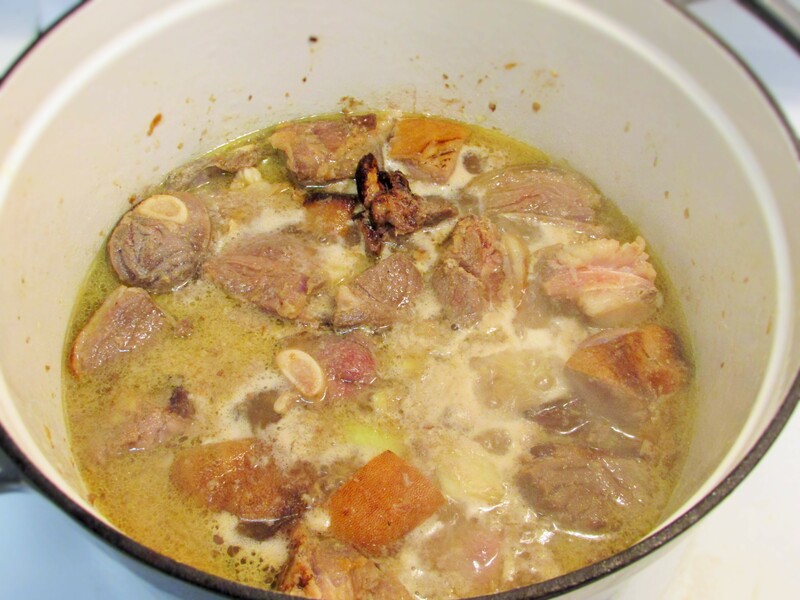 Remove the meat from the oven and pour into a heat proof bowl or the same pot with which you cooked the meat stock, this will help the meat soak up whatever juices that have been left over in the pot. 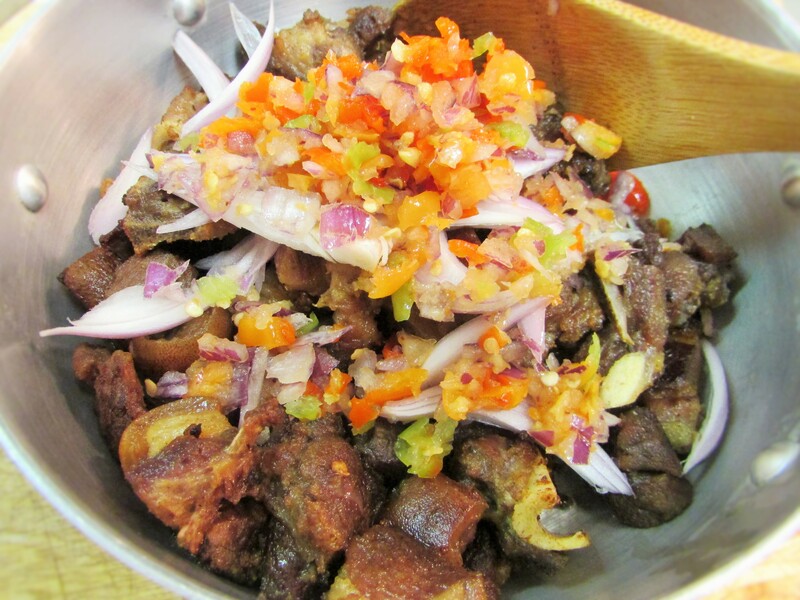 pour in the onion and pepper mix and toss it together with the meats and serve after garnishing with sliced scallions or some more red onions. 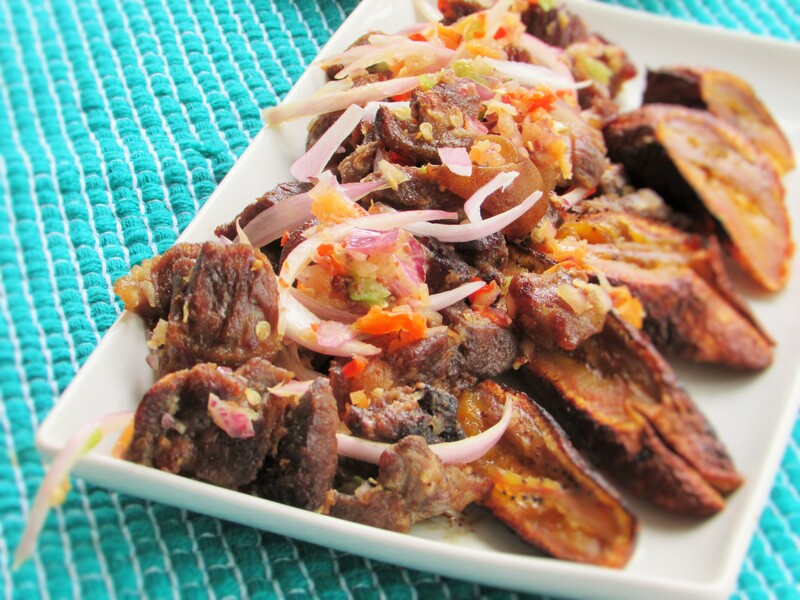 You could slightly pan fry the goat meat in a little bit of oil when there is no oven and stir with the pepper and onion mix. After the first phase of seasoning. I did not really need anymore seasonings. Taste as you go to make sure. You may also reduce the amount of onions you use if you want. I used a lot because I like onions. 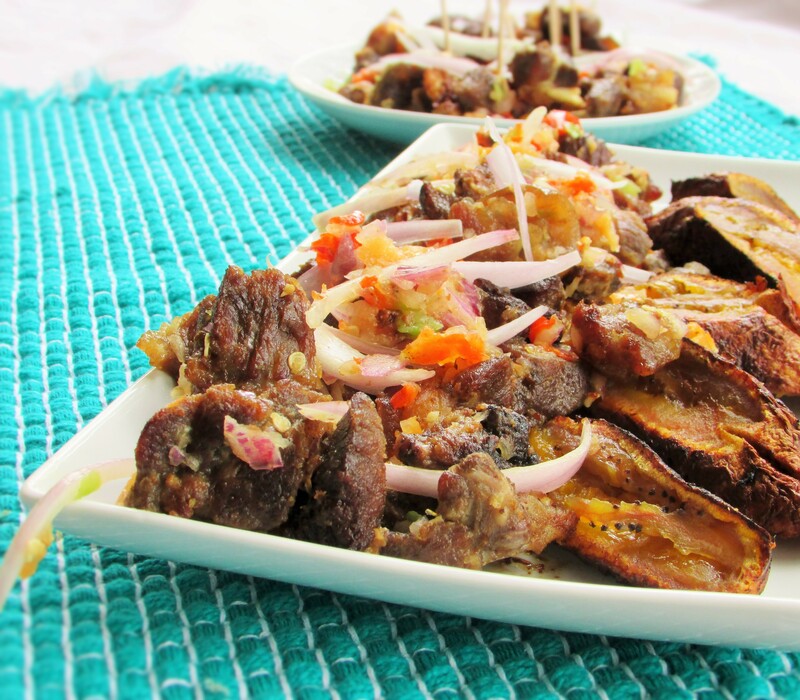 This entry was posted in Appetizers, Beef suya, Goat Meat, Nigerian snack, Peppered meats, Small chops, Snack and tagged Asun, Asun recipe, Barbequed goat, Barbequed goat meat, Goat meat, Goat meat asun, Meat and pepper, Nigerian peppered meat, Nigerian snack, peppered goat, peppered goat meat, peppered meat, Small chops, spicy Barbequed goat meat. Your works are so wonderful and well educative. God will bless you more abundantly. thanks for sharing the recipe but please what’s pepper mix? 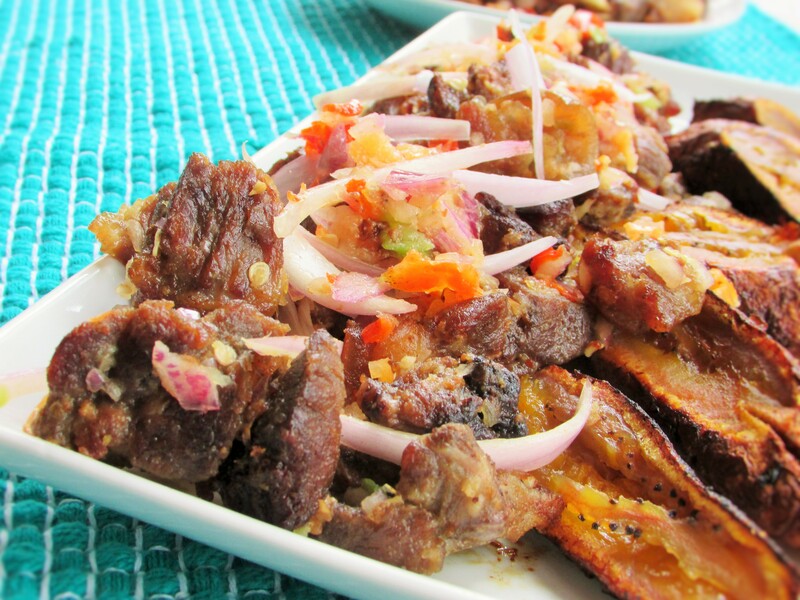 Looks nice, but did u say 48hours to marinate? 1-48 hours with 48 hours being the max. it helps with infusing the flavours and helps the meat stay tender. God bless you! Found you on CNN. Love love love. Keep your recipes coming. My ]kitchen are going to be very busy. 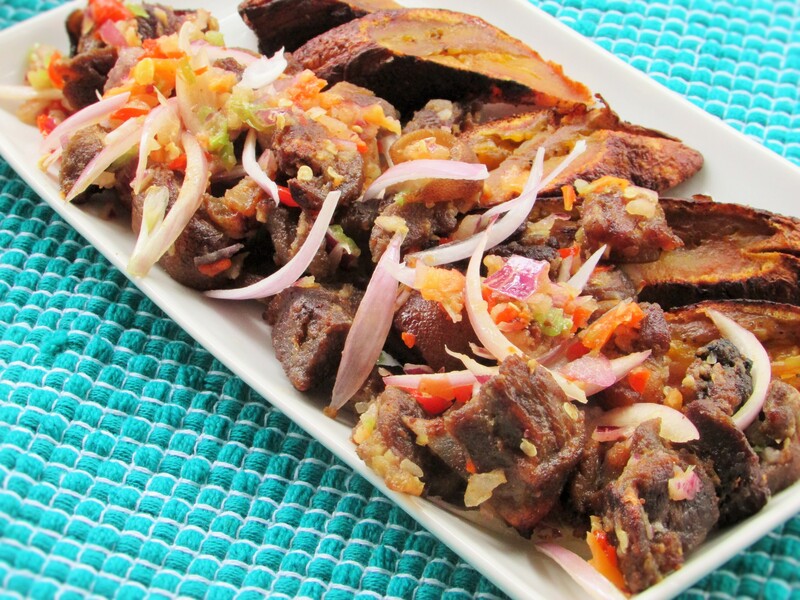 Please can I just fry the pepper and turn in the goat meat and stir instead of putting it in the oven? I don’t have an oven.